Metro is holding four community meetings in March to discuss alternatives to extend the Crenshaw/LAX Line north with transfers and connections to the Metro Expo, Purple and Red Lines as well as numerous heavily traveled bus lines. The public is encouraged to attend and participate in the planning of this key transit project. The Crenshaw/LAX Line is currently under construction and runs between the Metro Green Line and the Expo Line’s station at Crenshaw and Exposition boulevards. With a scheduled opening in 2020, the first phase of the Crenshaw/LAX Line will provide light rail service to the Crenshaw Corridor, Inglewood and LAX communities. The Crenshaw Northern Extension is a Measure M-funded project that will continue the line north of Exposition Boulevard and the Expo Line, with the extension serving portions of the cities of Los Angeles, Beverly Hills and West Hollywood. A feasibility study for the project was released last summer and there are five potential alignments under review (see map above). Metro will be conducting this screening study through fall 2019. Information from this study will be used to help determine which alignment options will be studied further in a formal environmental review process anticipated to begin in early 2020. The Crenshaw Northern Extension project — when combined with existing and future Metro projects — will ultimately provide a rail connection between the South Bay, LAX area, South Los Angeles, Inglewood, Crenshaw corridor, Mid-City, Central Los Angeles, West Hollywood and Hollywood communities. Measure M allocates $2.24 billion to the project, with a groundbreaking date of 2041 and project completion date of 2047. Metro is conducting this study now as there are efforts underway to identify funding to accelerate this schedule. This project is one of many funded by Measure M, the sales tax ballot measure approved by 71 percent of L.A. County voters in 2016. The information at all four community meetings will be identical. Thursday, March 21, 2019, 6 – 8 p.m. at the Westside Jewish Community Center, 5870 West Olympic Blvd. Los Angeles, CA 90036. Accessible via: Metro bus lines 30, 217, 28, 728 and 780. Limited parking in a lot and the street is available. Saturday, March 23, 2019, 10 a.m. – 12 p.m. at Virginia Road Elementary School, 2925 Virginia Road, Los Angeles, CA 90016. Accessible via: DASH, Metro bus lines 38, 210, 710 and 740. Parking in a lot and street is available. Thursday, March 28, 2019, 6 – 8 p.m. West Hollywood Library, 625 N. San Vicente Blvd. West Hollywood, CA 90069. Accessible via: DASH, West Hollywood Cityline and Metro bus lines 4, 10, 16, 30, 105 and 704. Limited street and parking lot available. All Metro meetings are held at ADA accessible facilities. Spanish translation will be provided for all meetings. Korean translation will be provided for the March 26 meeting at United Teachers Los Angeles. Russian translation will be provided for the March 28 meeting at the West Hollywood Library. Other ADA accommodations and translations will be available by calling (323) 466-3876 or California Relay Service at 711 at least 72 hours in advance. For more information contact the project at (213) 418-3093 or visit crenshawnorth@metro.net or metro.net/crenshawnorth. Route B!!! I support Route B as the best alternative. @L.A. Metro, Your best option is to go for Route A, as the area has enough destinations to go at and has density on that corridor. Can’t get this wrong. Does this even need to connect with the red line? Just follow the old PE route up San Vicente and end at the WeHo bus yard. If the private ROW still existed between Santa Monica Bl. and Highland I’d say go ahead and connect the two but as of now save the money for something else. The route definitely needs to connect with the red line to provide direct service from Hollywood to LAX. Otherwise, travelers would have to go via Vermont with 2 transfers. Why do you think it doesn’t need to? Build it in phases? Sure, but to let yet another half baked project like Green Line happen again? No thanks, that would actually be a waste of money. I agree with Route A via San Vicente to Div. 7. No need to run on Santa Monica. Take the savings and add a connector to the current Expo Line to run some trains direct from Downtown to LAX without transfer. Option C or D. A and B are too complex to consider, especially when both attempt to emulate 2 lines in 1, in an awkward alignment. I understand why WeHo wants option A, but at the end of the day, this project is designed to provide commuters who drive/travel along La Brea, Fairfax, and La Cienega a faster alternative. I think C makes the most sense. D and E should not even be contenders. What about a hybrid of C and D? Have the line go up Fairfax to Wilshire and then bend East towards La Brea. Have a station at the East end of the Grove on the edge of Pan Pacific Park and then the next station on La Brea between Beverly and Melrose (perhaps Rosewood Ave.). Then go along La Brea with stations at La Brea/Santa Monica and Hollywood/Highland. Let’s have the best of both worlds by having access to the enormous tourist and local gathering place at the Grove and the (Orginal’s) Farmers Market AND having a quicker trip up to the Red Line. Easements underground would be tough and likely expensive, but maybe not so out of line of the budget if it was decided to go up San Vicente and Santa Monica Blvd. If one can dream, there eventually should be a line along Santa Monica Blvd. via Sunset/Silverlake/Echo Park that bends south at San Vicente and perhaps goes down La Cienega to Culver City or something. I’m guessing option E only exists because it’d be cheaper. Any station on that part of Olympic Blvd wouldn’t be as heavily used; the area currently has a lower density than the others (both commercial and residential), and I can’t imagine it being built up much in the next 20 years. ROUTE A (San Vicente) PLEASE!! This line is trying to accomplish what ought to ultimately be two lines. There needs to be an east-west line connecting to West Hollywood from the east via Santa Monica Blvd, (perhaps as an extension of WSAB via silverlake / echo park), and run the Crenshaw line north along La Brea for a quick north-south route through mid LA with a connection to said WeHo line. Then you have optimal overall coverage for this part of LA. 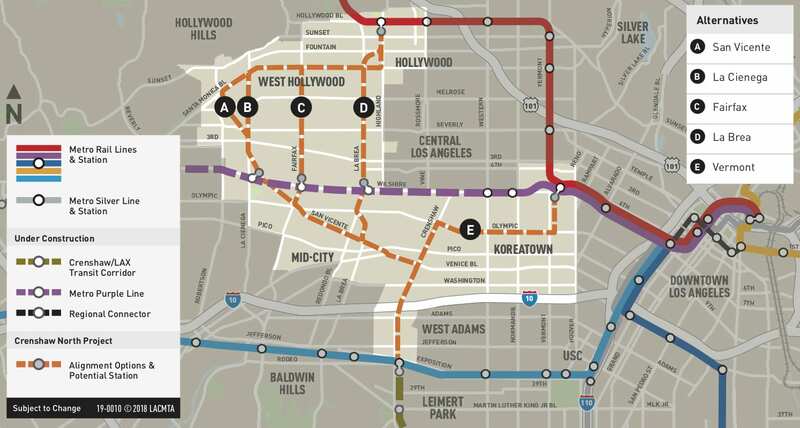 Of course, if the original purple line plans had been approved which had the branch through WeHo via San Vicente connecting to Hollywood/Highland, then the routing decision for this line would be way easier. But now, we’re left with a complicated decision requiring a tradeoff between hitting major destinations at the cost of speed and efficient routing, or having a fast straight central route but missing West Hollywood and the like. That’s unfortunate. That purple line branch would have changed everything. The Crenshaw Line already will be a very long line if thru-routed as the Green to North. It already is not very straight with the bend through Inglewood and LAX. From an operational standpoint, I vote D as the more direct option. While I understand WeHo want the line, remember the line is meant to serve a much larger area. I did write to Metro several times that using the Old Purple Line studies that a spur should come out of the same Hollywood/Highland station as the northern Terminus of the Crenshaw line, THIS spur should turn west along Santa Monica Blvd and turn turn south on La Cienega and in a perfect world, down La Cienega to Venice Blvd and connecting to Expo in Culver City and heck, maybe all the way down Venice to the beach. This would give We Ho connections to both Red, Purple and Expo. Maybe not as part of the Northern Extension of the Crenshaw line right now. But let plan for something like this- make sure the northern Terminus of Crenshaw is 3 tracks and can handle future growth or expansion. The thing is, this isn’t supposed to be a Green alone extension, that’s supposed to get its own extension to Santa Monica at some point. My guess is neither E nor C will advance out of this round, E because the station at Vermont is insanely expensive. C because the cost to building a station under the wilshire fairfax purple line station will be about 1.2 billion dollars just for the station, possibly more like 1.5 to 2 billion by the time they start building it. With all due respect for most of you people, but ya’ll are mistaken or delusional if you pick over routes A and B options. While some of you are for Routes C and D options, I believe you guys are not aware that they miss the great links towards density areas with residential, retails and over commercial buildings occupied by people who frequent the area. Put it this way. By selecting Route A, that’s like selecting the right NFL team to return back to L.A., which were the Rams who have a 49 year history in the Greater L.A. Area. Likewise, the San Vicente Boulevard has a history of hosting the old PE route in the early 20th Century and the street is still wide enough. In contrast to the selecting Routes D or E, that’s like choosing the wrong options, due to missing very important places. You guys gotta be wise on L.A. Metro’s future giving the folks of WeHo, Beverly Hills, Hollywood, South L.A. and the whole South Bay what they want. Can we have all of the above? Route “C” is best for Los Angeles at large. Along major city nodes. Would be great for the whole city!